Cathy Sultan, author, Damascus Street, helped 200 Main Art & Wine in Eau Claire, Wisc., launch a new “Women Writers on Wednesday” series the evening of Dec. 5. WEAU-Television, the NBC affiliate in Eau Claire, covered the event, which Sultan also previewed on Wisconsin Public Radio on late November. At the event, Sultan discussed her latest novel, which is set in a Lebanon still struggling to cope with the political repercussions of a bloody 15-year civil war. In the story, Andrew Sullivan, an idealistic American physician, becomes the unknowing pawn in a deadly spy game where an intricate cast of characters lures him into a maze of deception and illusion. As he attempts to find and rescue his fiancée Nadia, who was kidnapped by Syria’s former Intelligence chief, this riveting political thriller takes surprising turns in a tale of lost innocence and survival. The story is a sequel to The Syrian. Sultan has also written several nonfiction books about the Middle East and at the event explained the complexities of the Middle East, a place where nothing is as it seems. 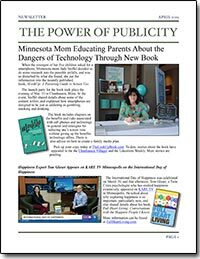 Like most retail, bookstores are busy places this time of year, and there was a weekend filled with book signings at the Barnes and Noble at Calhoun Village in Minneapolis from Dec. 14 - 16, 2018. Award-winning literary author Marilène Phipps signed copies of her memoir, Unseen Worlds: Adventures at the Crossroads of Vodou and Latter Day Saints on Dec. 14, and on Dec. 15, teen authors Justin M. Anderson and Bella Skaja signed copies of their debut novels, Nothing But Trouble and Demons Unfolding. That evening, Gary Lindberg, author, Letters from Elvis, spoke about the controversy his book has generated. After the talk, he too signed copies of his book. Sigma's Bookshelf Leads a Novel Writing Workshop at Highview Middle School in Nov.
November is Novel Writing Month, the perfect time for Sigma's Bookshelf to lead a novel writing workshop at Highview Middle School in New Brighton, Minn. More than a dozen students who participate in the school's creative writing club participated in a two-hour workshop on Nov. 29 where they learned about character development, story outlining, and how to go about getting their books published for free. Sigma's Bookshelf is believed to be the first and only free book publishing company for teens. Learn more about the company, which is volunteer run and donor supported, at SigmasBookshelf.com. Make a tax-deductible donation that will help cover the costs of bringing teen authored books to market at no cost to them via the organization's page on Give MN. The holiday season has arrived. If you haven't done it already, pretty soon you'll probably be spending a lot of time with friends and family; but for those people who have conflicts with their family, or significant other, the holiday season can be dicey. Keith R. Wilson, a psychotherapist from Rochester, N.Y., was interviewed on WHEC-TV in Rochester the morning of Sun., Dec. 16. He talked about the most common types of conflicts people in relationships of all kinds typically deal with and the biggest trap people often fall into when dealing with conflict: trying to come to terms with their partner before they really dig in and look at their own thinking and behavior. He also offered strategies for traveling the road to reconciliation before the holidays arrive, and how people can use his new book, The Road to Reconciliation: A Comprehensive Guide to Peace When Relationships Go Bad, as a roadmap for putting their differences aside. Pick up your copy at www.theroadtoreconcliation.com. Launch Event Held Nov. 15 for "We Sit, Paintings by Marley Kaul, Poems by Taiju Geri Wilimek"
Minnesota Teen/Grandmother on Tour to Promote their Book, "Cakewalk: The Science of Happy"